Tony Chan Carusone completed the B.A.Sc. and Ph.D. degrees at the University of Toronto in 1997 and 2002 respectvely, during which tme he received the Governor-General's Silver Medal. Since 2001, he has been with the Department of Electrical and Computer Engineering at the University of Toronto where he is currently an Associate Professor. From 2002 to 2007 he held the Canada Research Chair in Integrated Systems and in 2008 was a visitng researcher at the University of Pavia. He is also an occasional consultant to industry, having worked for Snowbush Inc., Gennum Corp., and Intel Corp., all in the area of high-speed links. Tony was a co-author of the best student papers at both the 2007 and 2008 Custom Integrated Circuits Conference and the best paper at the 2005 Compound Semiconductor Integrated Circuits Symposium. He is an appointed member of the Administratve Commitee of the IEEE Solid-State Circuits Society, a member and past chair of the Analog Signal Processing Technical Commitee for the IEEE Circuits and Systems Society, and a past member and chair of the Wireline Communicatons subcommitee of the Custom Integrated Circuits Conference. He has served as a guest editor for both the IEEE Journal of Solid-State Circuits and the IEEE Transactons on Circuits and Systems I: Regular Papers, and served on the editorial board of the IEEE Transactons on Circuits and Systems II: Express Briefs from 2006 untl 2009 when he was Editor-in-Chief. Thorough coverage of contemporary topics, such as digital error correction, tuning and calibration, both oversampled and Nyquist-rate data converters, and integrated phase-locked loops. 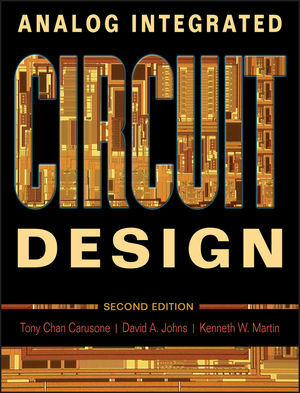 An intuitive approach and emphasis on practical design and analysis make it the reference for both students and practicing analog designers alike.